What is the TRUE Function? The TRUE function is categorized under Logical functionsFunctionsList of the most important Excel functions for financial analysts. This cheat sheet covers 100s of functions that are critical to know as an Excel analyst. It will return the logical value of TRUE. The function is equivalent to using the Boolean value TRUE directly in a formula. In financial analysisFinancial Analyst Job DescriptionSee a real Financial Analyst Job Description including all the skills, experience, and education required to be the successful candidate for the job. Perform financial forecasting, reporting, and operational metrics tracking, analyze financial data, create financial models, the TRUE function is often used with other logical functions such as IF, ERROR, etc. It is related to the FALSE function. The TRUE function does not require a parameter or argument. If we type =TRUE() in a cell, we get the result as TRUE. One can also enter TRUE function directly into a cell. Even if we do not add the parentheses, it will return the Boolean value TRUE. Now, let’s consider another example. Using the formulas below, the TRUE function will return the Boolean value TRUE. The TRUE function is provided for compatibility with other spreadsheet applications; it may not be needed in standard situations. We also need to remember that logical expressions themselves will automatically generate TRUE and FALSE results. 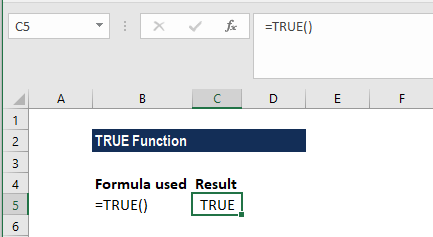 The TRUE function was introduced in MS Excel 2007.